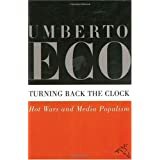 Turning Back the Clock: Hot Wars and Media Populism ReviewNowadays, when most authors writing on social and politcal events or trends are motivated primarily by their partisan agendas, it is a refreshing and enlightening experience to read from someone like Umberto Eco. The acclaimed author of FOUCAULT'S PENDULUM and THE NAME Of The ROSE, who also happens to be the world's only famous medievalist and semiotician, is an endangered species: an original thinker, whose ideas and opinions derive not from organizational or ideological loyalties, but rather originate out of independent observation and evaluation. I may disagree with Eco on more than a few things inside this book (as, for example, his uncharacterically unfair treatment of both Mel Gibson and the PASSION Of The CHRIST in the essay "Hands Off My Son! "), but at least these thoughts are his own. TURNING BACK The CLOCK: HOT WARS And MEDIA POPULISM is a collection of essays based on a number of Umberto Eco's articles and lectures between 2000-2005. The majority of these pieces originally appeared in the Italian newspapers L'espresso and La Repubblica, they are short, informal, even humorous. They are also, however, very serious in their intent, and are models as to what opinion pieces in journalism should be. Eco's writing here takes on everything from what he terms paleowar vs. neowar (in the essay "Some Reflections on War and Peace), media monopolism and movies to HARRY POTTER and THE DA VINCI CODE (from "Those Who Don't Believe in God Believe in Everything), from Nigerian beauty pageants (in "Beauty Queens, Fundamentalists and Lepers") to political correctness and multiculturalism to Islamist terrorism and Islamophobia as well. Want to learn more information about Turning Back the Clock: Hot Wars and Media Populism?